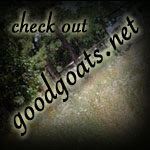 This page has pictures and info on the Mini Nubian does we currently have here at Good Goats. I will try to get updated pictures and put them up of all the does. 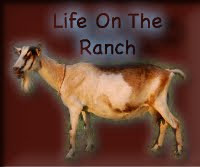 MoReen is from Icthus Ranch in Llano, Texas. Mo needs a little bit of help with her ears, which are still airplane, in a 2nd Gen. doe. She could also use slightly straighter front feet, and a flatter rump, but she is VERY smoothly blended. She is long, level, and flat boned. Mo has a wonderful udder and produces a great amount of milk! 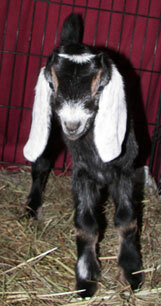 Bridget is a 2nd generation Mini Nubian doe. She is colored very pretty. Her ears are about 2/3 drop, so not the best. Bridget has a very nice and soft udder, with good attachment and teats, and also is easy to milk. LaWanda is a 1st generation doe. LaWanda is black with gold trim, frosted ears, and some white splotches. She has a very nice udder and is a wonderful milker. Whitney is a 1st generation doe. She is blue-eyed, black, white and some gold trim. Whitney is a very sweet and friendly doe. She milks wonderfully and has a great udder. . . looks like a little basketball. She also is a very small and petite doe. Doris is a 1st generation, extremely friendly and sweet doe that will follow you everywhere you go. She is on the bigger side for a 50/50% mini, but gives a ton of milk, and is a good mother. Doris is black with white spotting and gold trim. Doris kidded to quads in 2007 and raised them all. Verona is a 1st generation doe. She is extrememly small and is a very flashy black and white swirled doe. She has a very nice udder and produces a great amount of milk. This is Hug, one of our mini doelings from 2007. She is an extremely nice typed and flashy 1st gen. mini doe with ears like a Nubian, very small, nice legs and feet and is very well put together. Her sire is an 1st gen. mini, PawPawNin Junior Mint, and her dam is a standard Nubian, The Milky Way Stars. She also has a great udder, with nice teats and is a great milker! Maggie is a 2nd gen. doe. She is one of Verona's kids from 2007. She could also use some help with her airplane ears, but otherwise is a very nice doe. She is a blue roan/white swirl - very flashy! She is also polled. Piglet is a 1st gen. doe, and was our last kid born in 2007, so was just a little extra spoiled then. She has wonderful ears and breed type, and comes from great milking lines. She has a nice udder and is super easy to milk. She is an extremely friendly lil' doe and was the baby of the year! Maple is an absolutely beautiful 1st. gen. doe. We lost her dam after she kidded, to kidding complications, so Maple is the replacement, only more colorful, and special :). Her ears are extremely long, and she is just a wow! 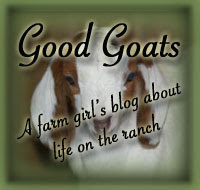 Her sire is Good Goats Mr. Goodbar and her dam was Adams Funny Farm Allegre. Blueberry is a beautiful, 1st generation, blue eyed doe. She is not the most colorful girl, but is very nice typed with a level topline and good feet and legs. Her ears are also nice and long. Blueberry kidded as FF in 2010, and has a great udder! Thanks to Jena of Urban Acres in Poway, CA for this doe! This is Frenchie, one of the doelings we kept from 2009. She is a very correct and very level doeling. Her dam is Icthus VML Champagne Kiss, who was a very nice doe, but I no longer have in my herd, but I do have Frenchie's grandma still - Dream Weaver's MoReen. Mo is a very nice doe also - see her at the top of this page. Frenchie's sire is Dreamy-Hollow Parker. Frenchie was accidently bred and kidded in 2010, but it was an easy kidding! She has a great udder and is super easy to milk, and produces a nice amount! Princess is an interesting doeling. She is level on her topline and comes from wonderful milking lines, but her head is oh, not so cute I guess! Her ears folded funny when she was a kid, and I taped them, but I didn't keep them taped long enough so they went back. Oh well. It's just little Princess! 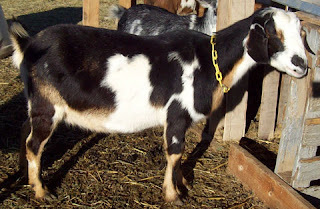 Her dam is Good Goats JM Piglet and her sire is PawPawNin Quiet Wyatt. Princess is also polled. Starlight is a beautiful little doeling. When she was born, we all said we were going to keep her! Her ears are SUPER long, and she is a big girl. At the moment, she is kind of in the "gangly-stage" but once I get a good picture of her, I'll put it up. Her dam is one of our Nubian does, Northwest Goats Lil' Prissy, who has a beautiful udder and milks very well and for a long time. Starlight's sire is PawPawNin Junior Mint. This is Toasty. She is a nice little doe. Her dam is PawPawNin Verona and her sire is PawPawNin Junior Mint - both great milking lines. Toasty is not as level as I'd like her on her topline, but I am trusting with time she will level out. She has nice ears and otherwise is a very nice little girl.